Sportif have been working with ION-Club, formerly Club Mistral, in the UK offering windsurf & kitesurfing holiday packages for over 25 years with pre-bookable rental & instruction. 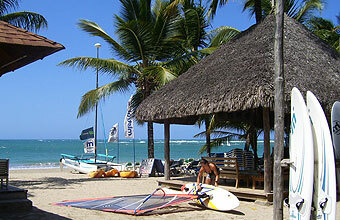 Sportif offer tailor-made windsurfing holidays to the best windsurf & kitesurf holiday locations around the world. Sportif holidays are designed for everyone - from Learn to Windsurf to our famous, expert led Sportif coaching clinics. Spain Golf de Rosas Tarifa Canaries Gran Canaria, Fuerteventura. ION-Club Centres stock the latest equipment from Fanatic, North and North Kiteboarding with choice of boards and rigs - all pre-bookable at discounted rates through Sportif with fully ATOL guaranteed holiday packages. These sociable windsurf & kitesurf coaching weeks offer a relaxed group holiday, with one to one instruction allowing you to work on specific skills and progress our skills quickly. Sportif also provide specialist holidays with multisport options allowing you to Windsurf, Kitesurf & Surf. You can choose to try new sports during your holiday or combine rental and instruction. Discounts are given to multisport options and for 2nd usuage of equipment or combining 2 or more sports with the Joker package. As an independent tour operator, we tailor make holidays to suit you. We are not tied to offering you a set programme.